What? On my own? In a food market? You should have seen the dust move. 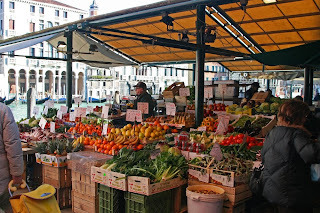 Food markets for chefs are like the row of chic jewellery, clothes, textiles and glass shops that run from the Rialto to San Marco’s are to the rest of the world. You need it. You’ll know about the Rialto of course. Even if you haven’t been to Venice. It is the market, the meeting place - and that’s back in the times of the Merchant of Venice. But as you become a more experienced itinerant (as Venetians call visiting tourists) you start to learn the secrets. And one of them is the market stalls in the Campo Margherita. Venice is really just a serious of very small islands all joined together by bridges. Each of these small ‘islands’ has its own campo (square) and church. The Campo Margherita is one of these secrets. The new glass bridge in Venice, much ridiculed for it’s over-spend and delays, has sealed the fate of many traders in that it takes visitors directly from the Piazzale Roma (the main entrance point, and the end of the road literally - for any road vehicle at least, to Venice) over the bridge and on through Cannaregio passed the Rialto to Piazzale San Marco. If you there just for the day (perish the thought) you might never cross onto the San Palo/ Dorsoduro side. This is why, walking through the Campo Margherita, you see mainly locals. At the weekends you see the Italian locals too. And when you see the locals you know you’re on to something good. Like the Rialto the fish stalls (there were 3 of them there) start early - while the rest of the city is waking up, and by lunch time they’re packing up. But unlike the Rialto, the prices are much more reasonable. On Saturday and Sunday you see a real market place - antiques, clothes, fabrics, Murano glass - everything you see elsewhere in the city - again, everything but the inflated tourist prices. Yes - the Campo Margherrita is really the place. And while you’re considering your purchases you might just rest in one of the many tavernas for a cappuchino. 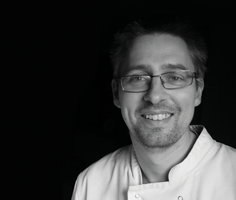 There’s so many things you can do with langoustines. But sometimes they are such good quality you want to just enjoy them as they are - less, as they say, is more. I went down the simple route. Turn them oven and cut them straight through the middle. Then place on a baking tray. Drizzle generously with olive oil and season with salt and pepper and place under the grill till cooked. And I served them with aubergine caviar as shown in the last entry and rocket (dressed with olive oil and lemon juice). What else could you do with my langoustines? You could also grill them on a flat grill, or griddle - the taste that the cooking shells impart - there can be no better taste. You could also sprinkle over chilli and garlic as they cooked, or chilli oil. You could also serve them raw as sashimi (not advisable for children, the elderly or pregnant ladies). You can also drop them in court bouillon for a minute so they cook that way, leave the body on but peel the tail, so you pick them up by the head and dip the tail in flavoured mayonnaise. Always buy your langoustines live. As soon as they die the flesh deteriorates. Like lobsters the flesh goes to a mush. They may be cheaper in a supermarket, but it’s worth finding out a real fishmonger who sells them live. It’s hard to find a good high street fishmonger these days in the UK - the old business model just doesn’t work with the reality of supermarket shopping. Many fishmongers have moved from the high street to obscure sites on industrial estates from where they serve the catering trade. Many of these are also open to the public - such as Simpsons in Stratford opn Avon and New Wave in Cirencester which I have been to - though I see now that New Wave have opened a shop in Cirencester (which I will have to investigate) - that is a good step forward. It’s worth looking these up in the yellow pages, and you can phone them an order to pick up, or if you‘re on their delivery route they may well deliver.